Plastic water bottles may provide one of the most convenient ways to obtain H2O, but they continue to wreak havoc on our environment. Despite having the ability to be recycled, nearly all of these single-use bottles end up in the trash. For those that don’t want to give up consumption through bottles, there could be a new way to simply eat the bottle after being used. Skipping Rocks Lab, a startup based in London, has received over $1 million US through crowdfunding to create the Ooho! Started by three guys in college back in 2012, their goal was to create a solution to the plastic pollution that has been destroying marine life. A few years later, they created a prototype for their product -- an edible blob of water made out of seaweed. 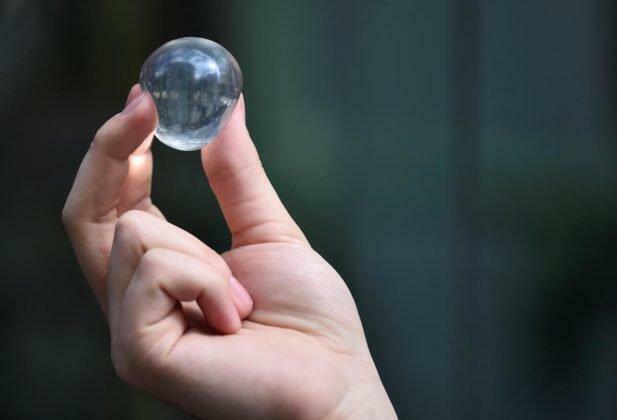 The product is similar to edible balls found in bubble or boba tea. It doesn’t have any initial flavoring, which could make consuming it a little bland, but there is the potential to add flavors. To create the protective casing, balls of ice are tipped into calcium chloride and brown algae extract. This stays solid even after the ice converts to room temperature. It only costs roughly two cents to create these edible balls. Even better, for those that don’t feel like eating the bottle, it’s biodegradable. When it’s thrown away, the bottle won’t be sticking around for hundreds of years like traditional plastic with polyethylene terephthalate. "At the end of the day, you don’t have to eat it," Pierre Paslier, one of the co-founders, told The Guardian. "But the edible part shows how natural it is. People are really enthusiastic about the fact that you can create a material for packaging matter that is so harmless that you can eat it." After the prototype became a viral hit online, it’s no surprise that the Ooho was wildly successful through crowdfunding. Since the bottle is squishy to hold and use, they tested out the prototype to make sure people weren’t turned off by the new product. It ended up being mostly accepted. Paslier believes that it would fit great with outdoor events and cafes. Ooho is consumed by peeling off the outer layer like an orange. One major difference from traditional water bottles is that when it’s opened, the product cannot be sealed again. This means we likely won’t see large variations of the bottle. In order to avoid large shipments, the product could be made on-site. Skipping Rocks Lab, which was also founded by Rodrigo Garcia Gonzalez and Guillaume Couche, received more than double their target amount through Crowd Cube. Expect to see the new product at various events beginning in 2018.